Tsongkhapa (Wylie transliteration: Tsong-kha-pa) (1357 — 1419) , whose name means «The Man from Onion Valley», was the founder of the Geluk (Dge-lugs) school of Tibetan Buddhism. He also known by his ordained name Lobsang Drakpa (Blo-bzang Grags-pa) or simply as «Je Rinpoche» (Rje Rin-bo-che). Born in Amdo province of Tibet during 1357, Tsongkhapa received full lay ordination at the age of three from the 4th Karmapa, Rolpey Dorje (Rol-pa’i Rdo-rje), and was entitled «Kunga Nyingpo» (Kun-dga’ Snying-po). At the age of seven he took a second set of vows from Chöjey Dhondup Rinchen (Chos-rje Don-‘grub Rin-chen) and was entitled «Lobsang Drakpa» (Slob-bsang Graks-pa). It was to his credit then, that at such an early age, he was able to receive the empowerments of Heruka Chakrasamvara, Hevajra, and Yamantaka, three of the most prominent wrathful deities of Tibetan Buddhism, as well as being able to recite a great many sutras, not the least of which was Expression of the Names of Manjushri. Additionally, he would go on to be a great student of the Buddhist Vinaya, the doctrine of behaviour, and even later the Six Yogas of Naropa, the Kalachakra Tantra, and the acclaimed practice of Mahamudra. 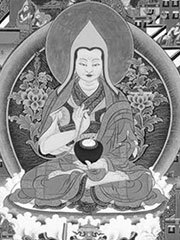 Tsongkhapa travelled extensively in search of knowledge and studied with more than 100 teachers of all the existing traditions all topics of the doctrine, including Dzogchen. In addition to his studies, he engaged in extensive meditation retreats. He is reputed to have performed millions of prostrations, mandala offerings and other forms of purification practice. Tsongkhapa had often visions of meditational deities and especially of Manjushri, with whom he could communicate directly to clarify difficult points of the scriptures. As such an accomplished scholar and practitioner, he was therefore quite effective as a teacher in Tibetan Buddhism, and became a leading figure amongst his peers as well as his students. Most of his teachers became also his students, like Rendawa, Umapa, the Nyingma Lama Lhodrak and they taught and revered each other. These scriptures are the prime source for the studies of the Gelugpa (Dge-lugs-pa) tradition and these and other teachings of Tsongkhapa endured into the modern age and are seen as a protection against misconceptions in Mahayana and Vajrayana Buddhism. Tsongkhapa founded the monastery of Ganden in 1409, and it became his main seat. He had many students, among whom Gyaltsab Dharma Rinchen (1364-1431), Khedrub Gelek Pälsang (1385-1438) and Gyalwa Gendün Drup, the first Dalai Lama (1391-1474) were the most outstanding. The annual Tibetan prayer festival Mönlam Chenmo (Great Prayer Festival) was established by Tsongkhapa and is seen as one of his Four Great Deeds. It celebrates the miraculous deeds of Buddha Shakyamuni.